The Un-Official Blog of Romance Author Maddie James: Accountability: Places, everyone! 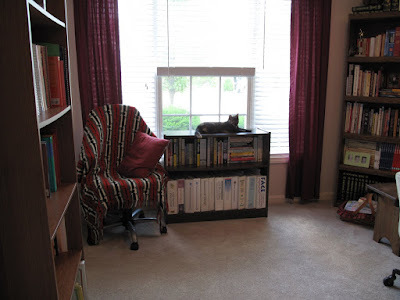 So, yesterday, I came out to the world about my terribly unorganized office. I admit it, so that is the first step, correct? That is, indeed, what they say. I even asked you all to hold me accountable and my dear friend Magdalena took that request seriously. My writer's cave. 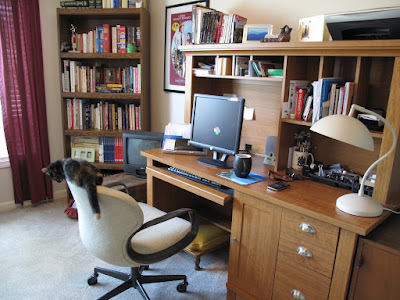 No, my clean and organized writers cave. A nice cat perch, huh? Clio definitely loves this new spot. I bought this little bookshelf from a surplus furniture sale from my day job office. I think I shall always have to leave the top uncluttered because Clio has definitely staked her claim to it. Lots of birdies and bugs to watch, not to mention people walking their dogs. What? 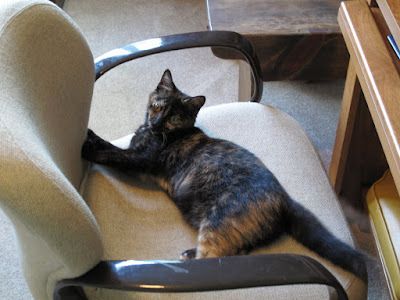 You want this chair, too? No way, sweetheart... It's time for Mama to get back to work. I like it. Don't you dare stop by MY office! :-) The kitten is a nice addition too. Your office looks AMAZING! Alas, my sitting room has half the living room furniture poked into it, due to our renovation project from heck. I can hardly wait for your closet episode, but will try to be patient. Maybe sometime this autumn? Um, Magdalena...remember, it took from January to August to get this far... :) Seriously, though, I do think fall is a good estimate. I'm on a roll and really, it's half done!